Casio has unveiled a new Android Wear-powered smartwatch at Consumer Electronics Show (CES). Dubbed WSD-F10 Smart Outdoor Watch, the timepiece is water resistant up to 50 meters and is tested to military standard specifications. Aimed at those involved in outdoor adventures, the watch comes with several fitness and outdoor activity apps including ViewRanger GPS trakking app, Runkeeper fitness app, and MyRadar weather app. The device packs in a range of sensors to provide real-time information about changes in the natural environment and activity levels. 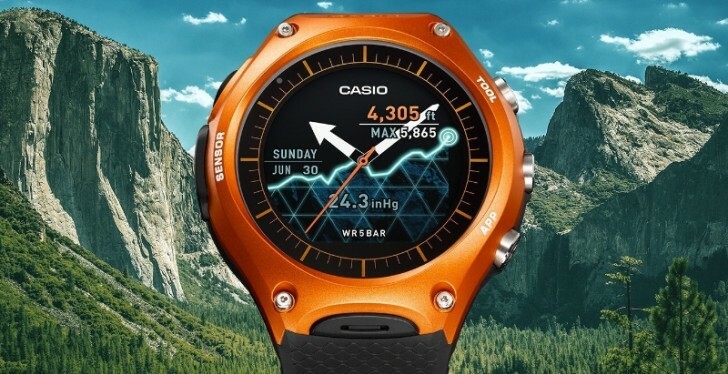 It also connects to your smartphone using a companion app dubbed Casio Moment Setter+. Specs-wise, the WSD-F10 Smart Outdoor Watch sports a 1.32-inch (320×300 pixel resolution) dual layer LCD display and offers Wi-Fi and Bluetooth connectivity options. Measuring 61.7mm×56.4mm×15.7mm (size of the case) and weighing in at 93g (including watchband), the wearable is compatible with both Android (4.3 or later) and iOS (8.2 or later) smartphones. The company claims a battery life of over a day on normal use and more than a month in the Timepiece Mode, which toggles off smartphone communication and the color LCD. The smartwatch is said to go on sale in the month of April carrying a price tag of around $500. i think its great a lot of people will like this watch if your a out door dude. just the price at the moment is high i think but will be trying one out for sure. don't comment then. the watch is amazing! look at it i mean come on! What does it do that other smart watches cant? Apple watch is garbage so i dont want to hear about it or this watch being compared to it.